This weekend was the 2nd Alaska get together of the U.S. Sidecar Association (USCA) in Talkeetna. 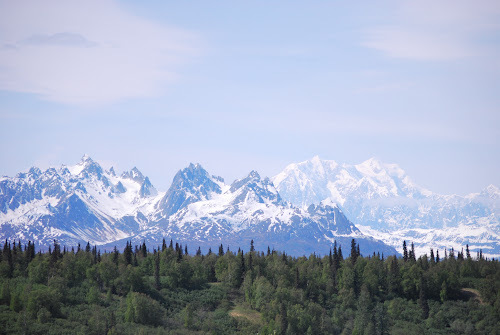 I had gone down last year and it is a very unstructured, Alaska type of non-event. Just an opportunity to sit around the coffee pot and talk. In this case, much of the conversation would be centered around motorcycles and sidecars. This photo is from the Parks Highway Monument again just outside of Fairbanks. At the McKinley View turnout at the southern end of the Denali State Park, I stopped to see if the mountain was visible. All except the peak could be seen but some of the closer peaks are just as spectacular. Plus it was a good opportunity to stretch out and relax my arm and back muscles. Even though the alignment is pretty good, the rig still takes quite a bit of effort to turn expecially the sweeping left turns when cruising at the speed limit. While parked here at the turnout, a number of tourists were looking at the rig when I returned from picture taking. They had all sorts of questions about sidecars and many had quit riding once they got older. After about 15 minutes, their bus started it's engine and they rushed back so they wouldn't be left by their tour group. When I arrived late Friday afternoon, there was only one other sidecar there. 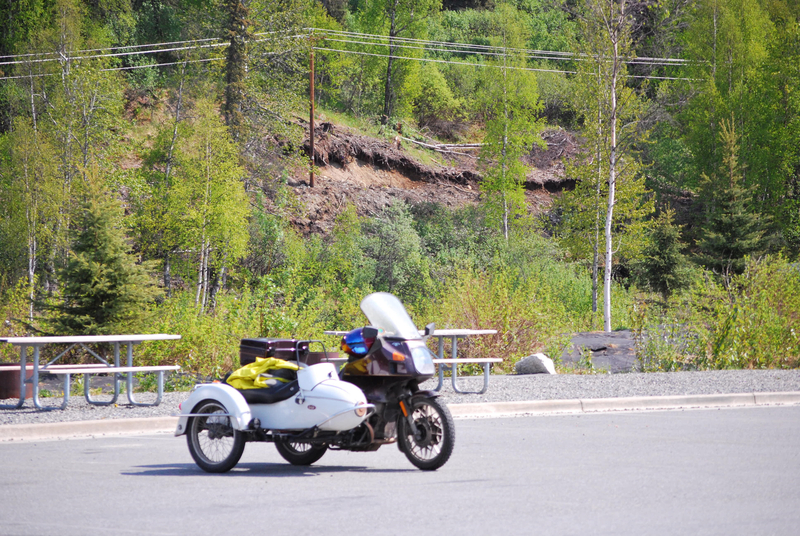 Dan, the Alaska USCA rep with his Yamaha Venture and enclosed sidecar. We spent the evening being entertained by his daughter and her friend setting up their tent and other activities. And the music from the next campsite which continued into the night. Thank goodness for ear plugs. The next morning, I went on the search for a coffee stand and walked all through the small town of Talkeetna. There were lots of tourists getting off of the train and tour busses at the edge of town as well as locals attracted to the craft markets, art shows, live music, softball tournament and other activities going on in town during the holiday weekend. Saturday turned out to be a beautiful day for wandering around town and stopping in the shops. I managed to not buy anything (except coffee) and even managed to ignore the home made ice cream and fresh baked pastries. There were lots of bikes rumbling through town. 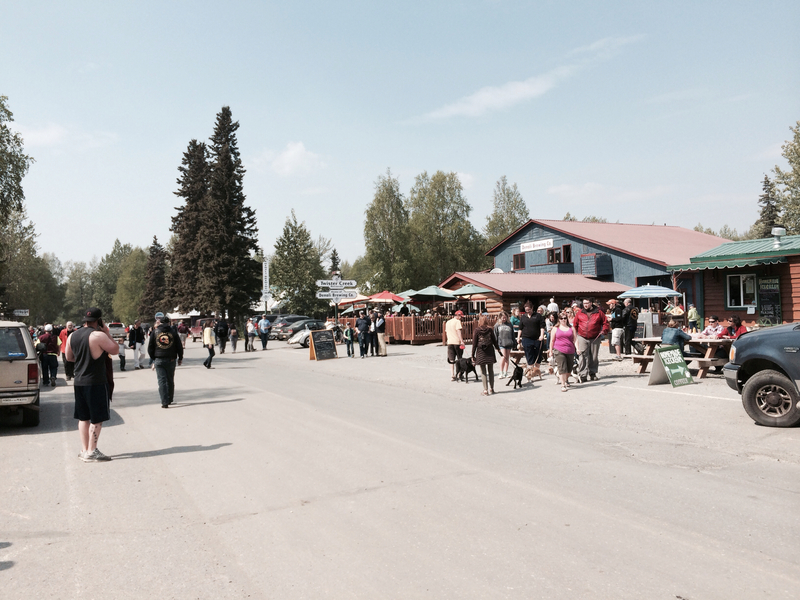 I think that many came up early for the ride to the Alaska Veterans Memorial on Sunday. 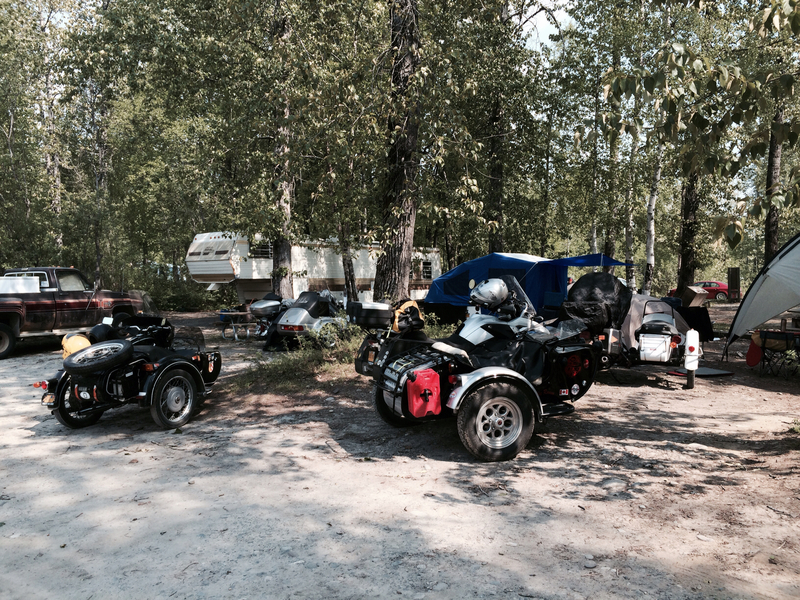 Shortly after returning to the campground, two more sidecar rigs joined us. 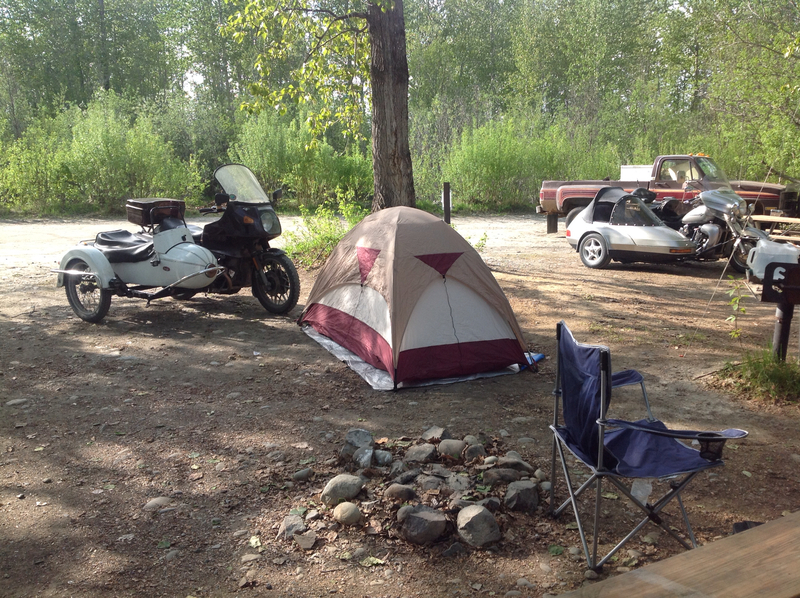 Bob and Sharon on the R1200GS with DMC sidecar (with all of the options!) and Dieter and Karen on their BMW which redefines the work "hack". We went into town to have lunch at the Wildflower Cafe and do a little more wandering with the tourists before returning to camp. Be sure to follow Bob and Sharon's trip this summer along the Pacific coast with their GS rig. They posted quite a few photos of the get-together on their blogpost. Here is the 4th side car rig. The frame is from an R60/2 with engine and transmission from an R90S and though you can't see it in this shot, the side car is a Ural. Other items are Harley mufflers an a modified leading link front end. It was modified to clear the front of the engine as the R90 engine and transmission is a bit longer than the R60 it replaced. I think the conversion was very nicely done though he mentioned that the BMW purists cringe when they see the rig. 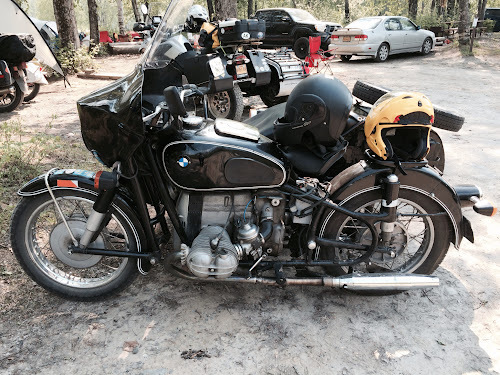 The /2 is the last BMW that came with side car mounts from the factory. It had rained most of the way back to Fairbanks on Sunday so no pictures and I had forgotten to charge the GoPro remote so no additional videos either. I'm not sure that I would survive a long road trip with the sidecar as after only 250 miles on the road, my arms, fingers and upper back were pretty stiff and sore. Cringe? I bet Bmw purists run screaming into the night when that Beemer rig appears....I like it! All the power of a R90 engine and drum brakes all around....hmmmm. How fast can it go? He says that it'll easily cruise beyond the speed limit but you will need to make an appointment if you want to stop. The sidecar wheel has a drum but no mechanism behind it so the three wheels are still all interchangable. Well, at least you know if you decide to go touring with the sidecar rig, you won't have long days at just 250 miles, but you might be just as tired. Or else I need to get into much better shape. OR you just need to take I-90 or any other straight road, or does it fight you whilst going straight too ? No, I don't care for interstates and only take them when I have to. Plus, the rig will pull to the right if you go faster than the speed you set things up for, go uphill, add weight to the sidecar, a headwind, a cross wind, putting on the windshield, the crown of the road, you name it. So there is no avoiding it. But the left turns do seem to take more physical strength than the right. 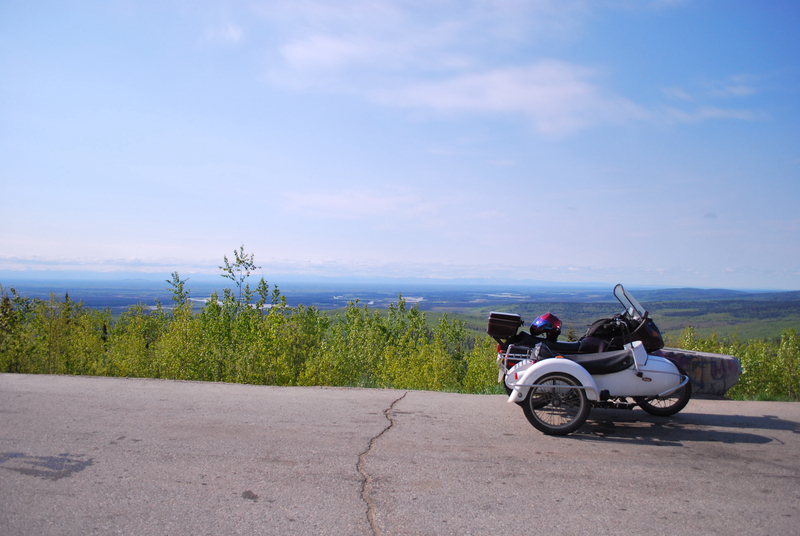 Ural's have a leading link front suspension which reduces the trail of the front wheel. So the steering would be lighter but you don't eliminate the effects of all of the other factors. Some sidecar manufactuers such as DMC have an electric lean adjustment which allows you to compensate for when you are travelling straight but it doesn't reduce the effort when turning. I vote you go sidecar free for awhile. I would think there would be a feeling of being freed. I always enjoy your photos that show towns and activities. I spend my work days now on asphalt (why oh why), so looking at the snowy mountains gave me a nice cool feeling. From 50 below to hot asphalt. If I took the sidecar off for a while, I'd have to get a different rear tire plus I get used to the carrying capacity of the side car. This morning, I went grocery shopping for the week and it all easily fit inside the sidecar. 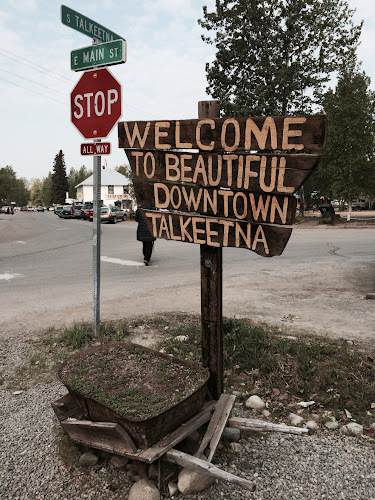 Thank you and I try to take pictures of the towns, especially the eclectic ones like Talkeetna. Richard, with a little bit of practice, those 250 miles will get easier......aren't they enough? 250 sounds about perfect to me. I suspect that you're right. On the way back, it rained for about a hundred miles and the nylon glove covers made it more difficult to hold onto the throttle grip. I think some sort of throttle "lock" would make things a little more relaxing.